IMPORTANT: This is not a show off, nor to brag about anything. That is not my style, btw. I believe that it is important you know the background of the person who is reviewing her/his meals so that you can put in context that person’s appreciation of her/his meals. It might not mean much since restaurant experiences are variable by nature, all kind of tastes abound in nature, but it is a piece of information that is delivered with the intent of sharing, so that that we are better informed, less ignorant, therefore I do hope it will serve you somehow. (PS: You will find, completely at the end of current post, a list of my favourite tables around the globe). This was the period of the best produce I ever sample in my entire life. Those years were spent in the Indian Ocean, and two decades later, I still have found no meat, no seafood, no veggies as stunning as those found during that era. At that time, I was living in Southern France. 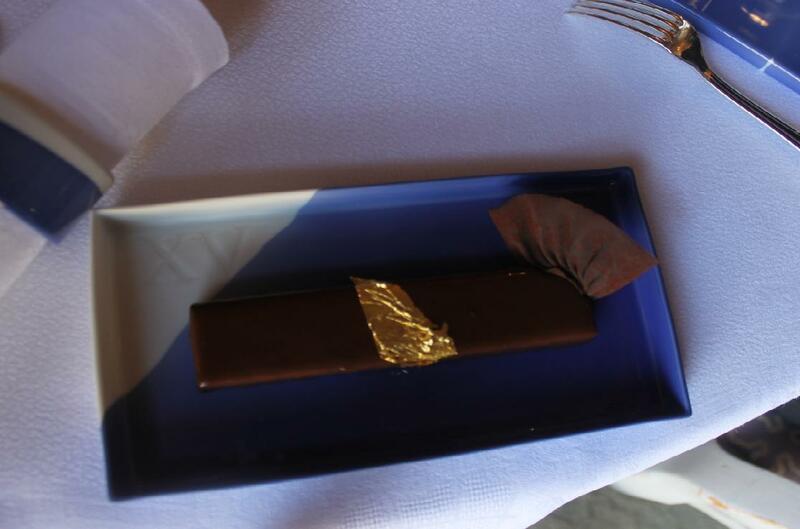 My very first Michelin star restaurant ever was 3 Star Michelin Louis VX of Alain Ducasse, in Monte Carlo. Hard to give a rating of that dinner since this was my very first introduction to such opulence and level of food. So nothing to compare it to at that time since this was the very 1st dinner experience of that caliber. Also: since this was a 1st time in a palace-looking setting, with such high level of service and food so expertly composed, I was simply impressed. 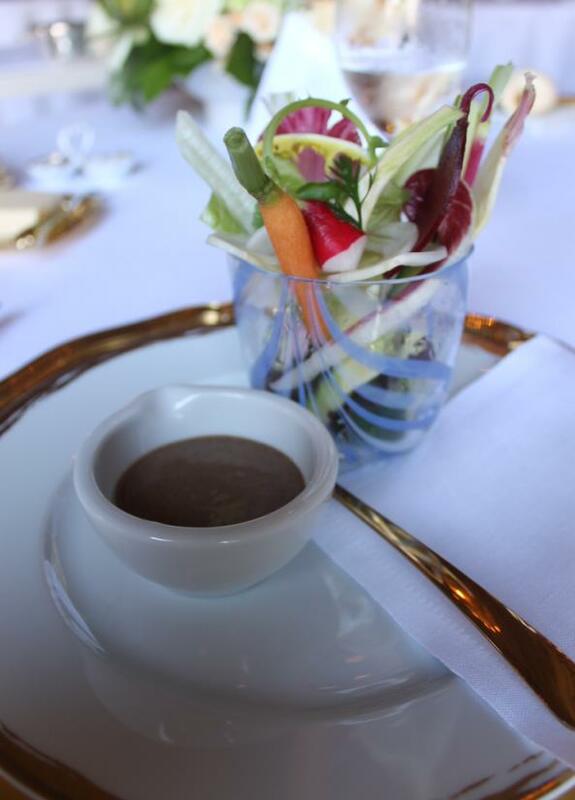 Subsequent meals at Louis XV have left me with less enthusiastic emotions, but there’s no denial that the produce serve there are simply stunning. 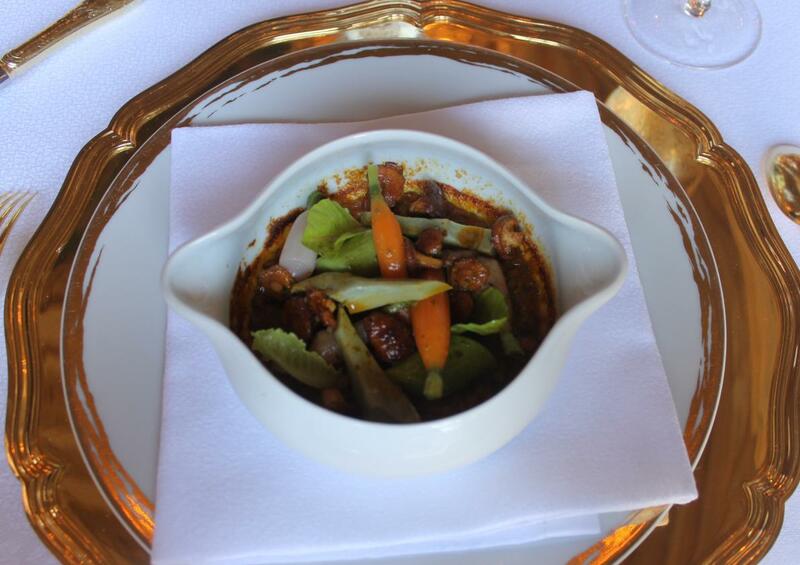 At that time the highlight was, for me, Jacques Maximin food at his 2 Star Michelin his restaurant Le Theatre. Chef Maximin was at that time among the most talented Chefs of French dining around the world and to some, like me, he was simply the best. 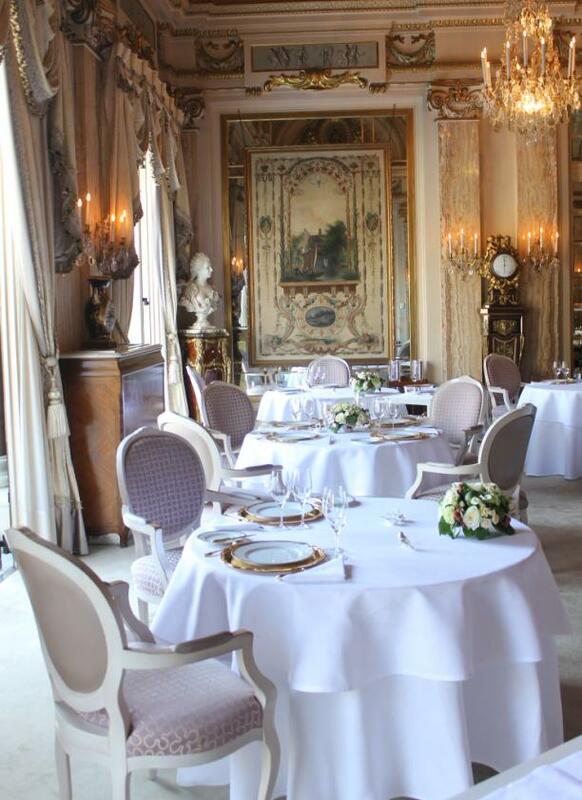 He actually let his friend Alain Ducasse at the helm of Louis XV and chose to go his own way with a relatively less spectacular restaurant setting. To me, he was far better than Ducasse…which can come as a shock to some….but to those who have been able to compare both Chefs at their very best, many will confirm that I am not wrong. This led to many other meals at Le Theatre, and on each occasion Chef Maximin just proved me right in elevating him in my top 5 best Chefs ever. 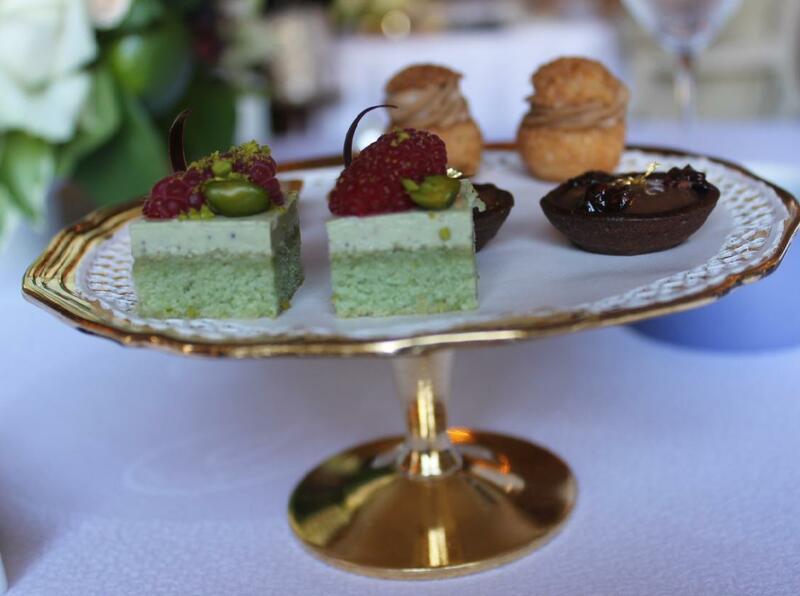 Ducasse himself has always considered Chef Maximin with high esteem, and many of the very best of French fine dinings found motivation in Chef Maximin’s guidance. Nowadays, many are impressed by Chefs like Adria, Blumenthal, Achatz, Gagnaire, Bras, Passard, Redzépi, Keller, etc. Although the latest are great Chefs, I believe that a Chef like Maximin was way superior because he had better natural cooking instinct and was gifted with a greater sense of flavor impact. My intent at that time was not to review restaurant since I would have never thought this to be a subject of interest: it’s purely subjective and food is just food. But some later events that came to my attention just legitimized my motivation to also provide my side of restaurant dining. On a personal note, this was the beginning of long years of intensive cooking and experiments. -Several high end restaurants and also street food meals in India, Thailand, Vietnam, Hong Kong, Burma and Singapore. At that time, Michelin stars were not really present in Asia but many tables in HK and Bangkok were already of at least 1 star. During those years, my favourite all-time Indian restaurant happened to be in Hanoi (Khazana). Street food in Bangkok was the most impressive of those, and my favourite all-time duck (HK), nem and phos (Hanoi) were sampled in that period. And Burmese cuisine was the best discover I made at that time. Up to 1995, my only experience with Michelin star tables was limited to the July 1990 dinner to Louis VX in Monte Carlo and Maximin’s dinner at Le Theatre. But this would change in an extreme way: 1995-1998 was marked by a visit to no less than 35 two and 3 star Michelin in Europe. 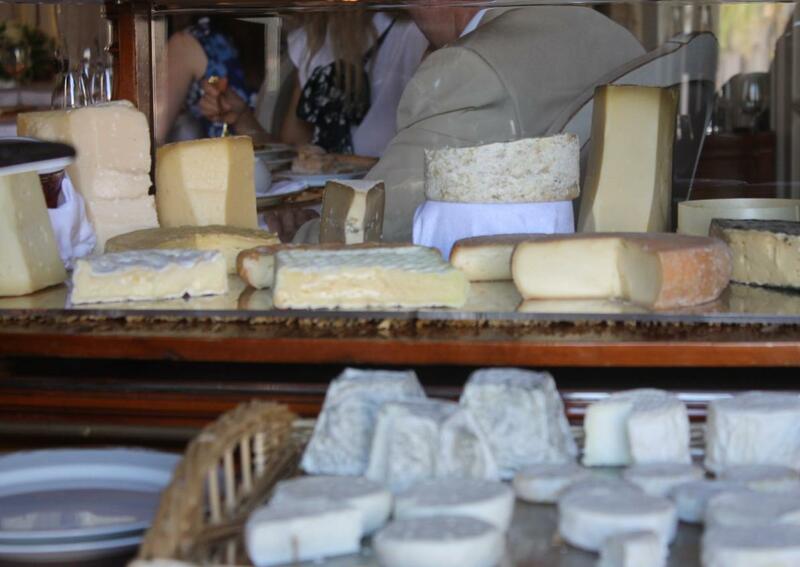 Not a lot for an intensive gourmand, but given the time consuming and careful selections, it’s also normal. 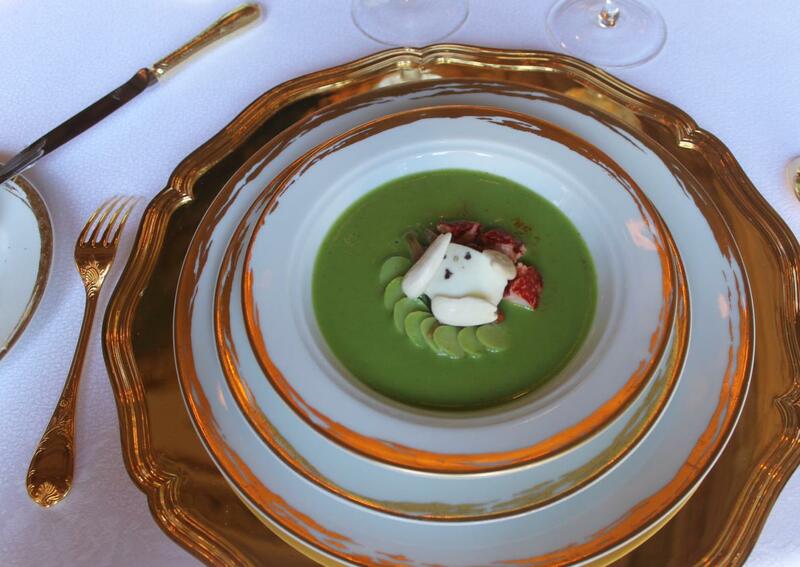 Among those, the major meals were sampled at Joel Robuchon’s Hotel du Parc and Fredy Girardet (1995), on that same year: Georges Blanc, Bernard Loiseau, Alain Senderens, Marc Meneau’s L’Espérance, Jung’s Au Crocodile, Gerard Besson, Westermann’s Le Buerehiesel, Vrinat’s Taillevent. In 1996, Bocuse, Pierre Gagnaire, Troisgros, Auberge de L’ill of Haeberlin, L’Arpège of Alain Passard, Michel Bras, and many more. I had only one big regret at that time: to have missed Chef Marc Veyrat (actually, by a silly and avoidable misunderstanding with the restaurant staff during reservation time). It’s of that era that I started to identify the type of Chefs which talent really impress me: Chef Christian Constant’s work at les Ambassadeurs (that he left in 1996) has being so marking to me that up to now, he remains in my lifetime top 5 best Chefs ever (along with JR, Girardet, Jean Francois Piège when he was at les Ambassadeurs – a discovery that will come later; see the ‘2000-2005’ era — , Jacques Maximin, Gerard Besson) . Chef Besson is my revelation-Chef of that period along with Constant. After 2 years of break (I am not a fan of food perse as you’ll find in my writings and those two years is a proof of that — when I go dining, it’s really to aknowledge the depth of skills of a specific kitchen and see what it can bring to me in my evolution as someone who has always been interested in techniques to push flavors and textures as far as possible within classic techniques), those 5 years were marked by sporadic visits to some tables known as very dominant at the time: 2000 was marked by 2 meals at El Bulli. This was my introduction to Adria’s work. At that time, his food was closer to classic French than what it turned into later. The two back to back meals were indeed marked by an exceptional sense of creativity and those too meals proved that Adria is also a fantastic classic Chef (although the most seem to remember him through what he did later: molecular cuisine). I never managed to get a reservation there the following years, which is not a surprise given the popularity that he later on enjoyed. So, my only experiences with his cuisine is limited to those 2 meals in 2000. Heston Blumenthal’ Fat Duck was a must-visit given the rise in popularity of Mr Blumenthal so FT was tried in 2005. It was total novelty for me (so nothing I could compare to, at that time), so hard to rate that dinner but definitely a must in terms of dining experience. Those years were completed with visits at Régis Marcon, Guy Savoy, le Meurice, Le Bristol, Les Ambassadeurs, three visits at le Cinq and many more 3 and two star Michelin tables. 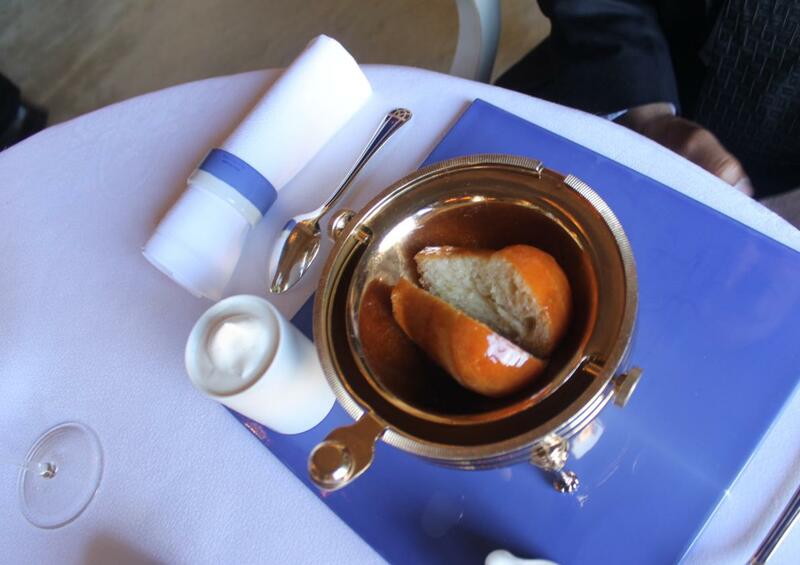 In 2004, a marking moment: the discovery of Chef Jean Francois Piège’s work at Les Ambassadeurs. He joins my lifetime top 5 best Chefs. Living so close to the US and having never tried their best tables would not make sense. So 2006, 2007 was focused on Jean-Georges, Daniel, Le Bernadin, Keller’s Per se and the French Laundry. I was –unexpectedly—disappointed by that period since I thought some of those 3 stars, during that rundown, performed less convincingly than at most 1 star tables I had tried in France. I am sure it’s not always like that, but on that given time frame, none of those big restaurants have left any great impression on me. I had the feeling of eating well executed food, indeed, but nothing more. That year, another break was necessary for me, especially after the very busy 2006. But a friend insisted that I give a try to something completely different from what I have experienced: Nordic cuisine based on an interesting take on foliage and from what he told me, in his own words, spectacular creativity. So, an exception was made along with another discovery recommended from that same friend: Alinea in Chicago. Alinea, along with FT were the only exceptions I made in moving a bit away from my favourite type of cuisine (classic or Modern French) into a style that I found interesting but that I remained not fond of (molecular). To some extent, I’d say that I found Noma’s more interesting, more fun, without necessarily moving me neither. A question of personal taste, as usual. 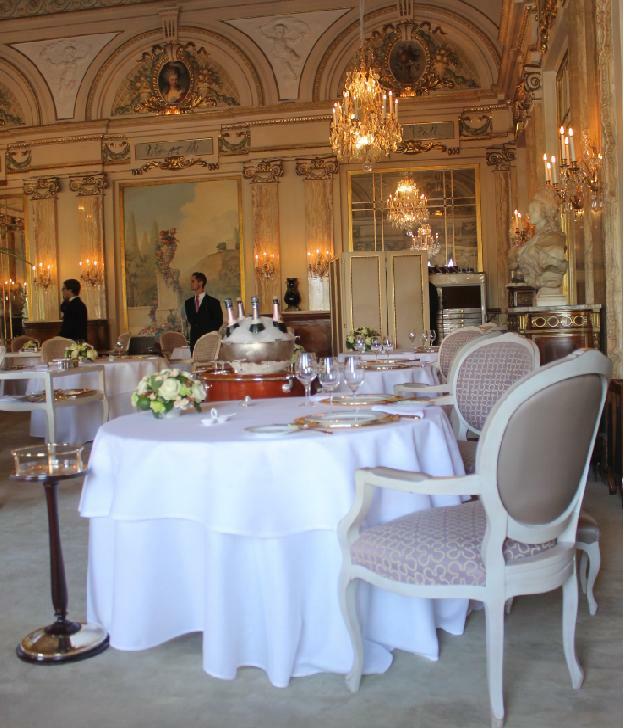 2011 – Visited the only 3 star Michelin Parisian tables that I had not visited to date: L’Ambroisie, LeDoyen. Chef Bernard Pacaud was at the helm on that lunch (there were only 3 tables occupied and since he is close to retirement, he seemed to be mostly working on lunch time when I was there) and his meal turned out to be the best 3 Star Michelin repast I ever enjoyed since the time of Joel Robuchon’s Hotel du Parc and Frédy Girardet. 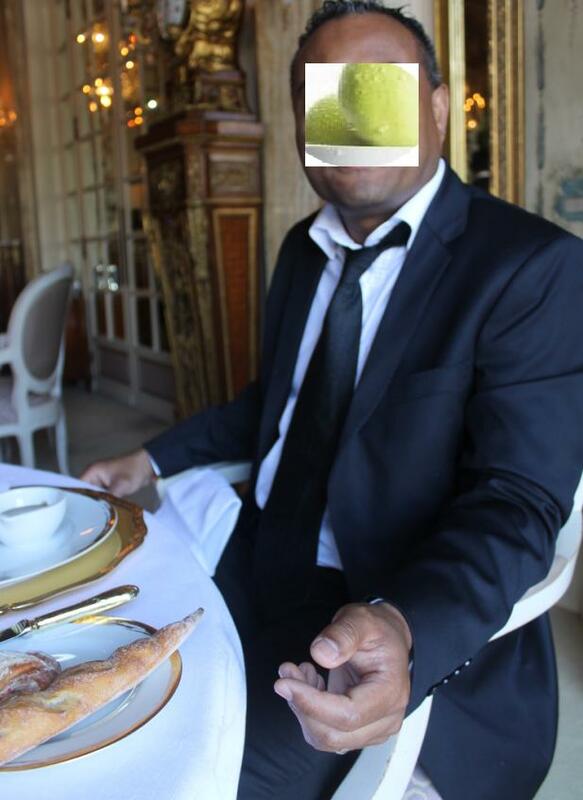 As for my meal at Ledoyen, it unfortunately did not impress (I never thought that I would one day stumble upon a lobster and citrus emulsion that would be discrete in terms of palatable excitement, an achievement that did materialized itself on my lunch here, hopefully just an off day) . Then I completed the year at a table which Chef I do consider as one of the very best titan-Chefs of the globe: Chef Christian Bau’s Victor Goumet Restaurant Schloss Berg. I took the time to review all three meals on current web site. In fine, I also visited San Sebastian in the Pais Vasco, temple of the famous pintxos (Pais Vasco’s tapas), and ended up being very impressed by their produce and work of flavors. It’s in those occasions that I am thankful to the Lord that he gave me a palate that is not muted ;p San Sebastian, as well as the entire Spain, is indeed one of world’s few real gastronomic destinations, because there…it is talent that commends the buzz. Not wind nor megalomania. 2012 – First time that I try some Michelin stars ventures in Italy (I do usually stick to their laidback trattorias whenever I am there and I am still ever fonder of those upon this visit of some of their Michelin stars ;p). This visit to Italy covered only the regions of Liguria, Lombardy, Veneto and Cinque Terre. As it so oftently happens to me whenever I do visit Italy, I found another coup de Coeur in their coastal regions and this time it is a tiny trattoria in Corniglia called A cantina de Mananan. Being born and raised with stunning produce all around me, oftenly elevated with brio by real gifted cooks, it was with great joy that I could re-connect with such great souvenirs in that little trattoria. Visited Michelin star destinations during this trip were 2 stars Il Luogo di Aimo e Nadia (classic Italian cuisine full of flavors where ingredients are not just of superior quality, but the cooking skills paying justice to that quality, too. I was impressed to see how younger Chefs carried on flavors passed from generations to generations, the only way..in my view..to get food plenty of soul. That is exactly how I would describe my lunch there, and this is the kind of cuisine that I appreciate the most. The locals told me that it was even better, before. So imagine…), then 2 stars Trussardi alla Scala in Milan, too (Nothing that I found out of the ordinary based on the usual 2 star Michelin standards that I know, thus I was not particularly moved, as I could easily name plenty of 2 stars that were more memorable in my mind. That said, not bad at all, good actually and a safe choice for some good upscale dining, but not a favourite neither), 3 star Michelin Dal Pescatore (My type of 3 stars, where there’s no fuss but a strong focus on real delicious Italian fare done with panache. A beautiful and lovely classic 3 star Michelin venture that I enjoyed a lot), then 3 star Michelin Le Calandre in Rubano (young, modern, fun place but the savouries left me indifferent as they were well executed but, for me, lacked mouthfeel excitement during that lunch there). 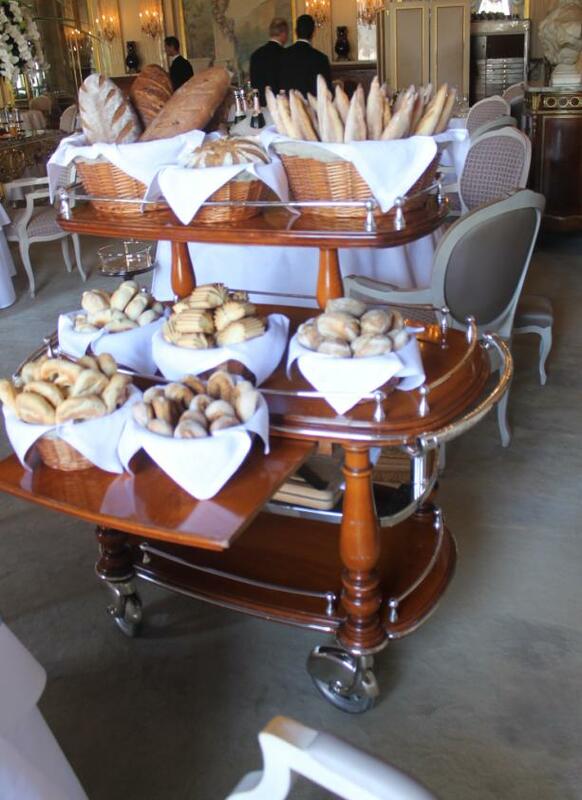 I took the time to review the meals at Le Calandre and Dal Pescatore on current web site. Sept 2013 – Went visiting two old time favourites after many years of no-show. First L’Arpège in Paris. There’s a lot of blabla about how easy it is to make food delicious and that food is inevitably delicious wherever there’s cream, sauces, etc. The problem is that reality unveils a totally different story: I remember a friend who I once brought to L’Ami Jean in Paris and he kept laughing at them suggesting that any meat that has fat in it and that you braise will of course be delicious and that he did not need L’Ami Jean to get to that point, Lol. It’s been almost 2 years now that that friend is trying to put his suggestions into practice, alas in vain, and he now understands … to borrow an analogy from music … that it’s one thing to observe thatà a song is made of octaves, it’s another thing to appreciate their nuances. Cases like this abound. Of course a bowl of ice cream with a bit of caramel in it is supposed to please the most, but 3,4,5 versions of that can vary, if you bother about details, from the ordinary to the most sophisticated (in depth of taste, for eg) even despite having the exact same appearance. So, that was how I’d describe this meal at L’Arpège: its finest dishes (yep, yep there are items I did not like, but they were long erased from my mind, largely overwhelmed by their finest counterparts), although simple looking are no easy dish to conceive for even the most ambitious kitchen brigades out there. And their taste, their taste, their taste was deep and divinely delicious!!!! Simple looking Vs easy, that’s for me the major difference to make, because I don’t go to restaurants for easy dishes. As simple as they might look, the dishes here were complex in reality: full of character,soul, inspired in their execution, so much so that even the dishes I did not like commanded admiration (take the dish of Arlequin de legumes. Really not to my taste, I even scored it with a 0/10, simply because the taste clashed with what I perceive as eventful, but I admired the creative execution because I know well that many will think that it is a matter of just adding semolina to some boiled vegetables, but that if you play attention to the nuances of that dish..well, it’s far from being as simple as that. It’s right there the problem of most kitchen brigades: they tend to confuse simple looking execution with easy creations, a problem that L’Arpège does not suffer from. L’Arpège continues to be in the top tier of my favourite 3 star Michelin restaurants around the globe. Then Le Louis XV in Monte Carlo, where the food has not impressed me this time (this, French/Med classic cooking is my favourite type of cuisine because you can do a lot, with very little, which is essentially all that interests me about food; for eg pot cooking vegetables is usually eventful since it’s the occasion for the aromas of the ingredients to truly express themselves, but unfortunately for me, although nicely executed, the food on this lunch had flavors that were generally discrete in their expression. And yes, of course, there is always a subjective level in what people think of as eventful or not, and for me those were uneventful flavours) , but it does not matter since the experience of being there, that world class service, the little details that makes a restaurant grand (the luxury, the carts of bread/outstanding cheeses, the presentation of the butter, etc) and that beautiful dining room are still amazing souvenirs for the mind and the eyes. I am not trying to balance my slight disappointment of the food (again, nothing bad, just not as eventful as I came to expect from such cuisine) with the positive comments about the overall experience …just for the sake of sounding fair, far from that..it’s just that when I don’t like, I don’t and I’ll say it but where it pleases me, I will do the same thing. 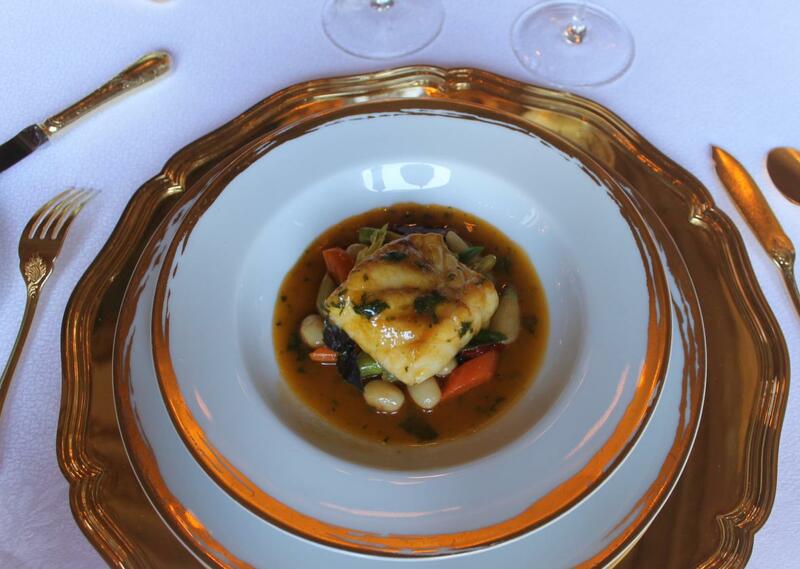 Regardless of the food performance that did not knock my socks off, Le Louis XV continues to be a grand classic experience that is unparalleled. 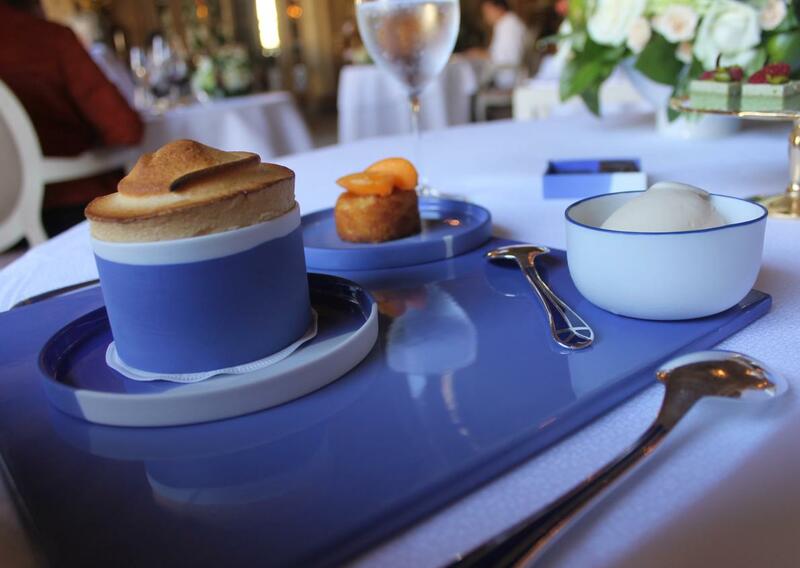 In Nov 2015, I tried 3 star Michelin Pierre Gagnaire for the 2nd time in 10 yrs. This is true world class French cuisine. I went expecting a meal made of ups and downs as sometimes accounted online, but what I suspect to be perceived as occasionally ” off ” at PG were actually their riffs on genuinely well conceived non french food items (for example, a take on the japanese chamachurri in the case of this meal). So, nothing technically faulty at all. 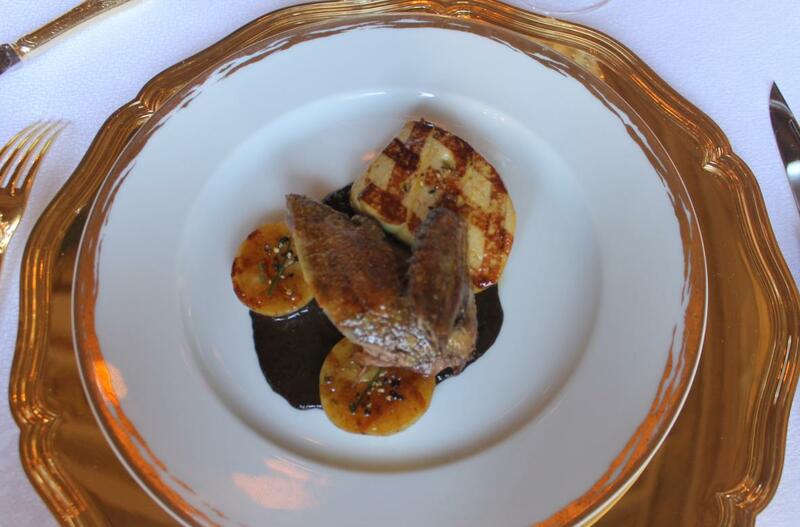 When comparing the rating of my meal at l’Arpege to the one at PG, you may ask why a 10/10 in the case of L’ Arpege and a lower rating for Pierrer Gagnaire’s (both essentially cooking French food regardless of how their food is described by the medias ) . Take that with a grain of salt as at this level of cooking, it is just a question of personal taste. But If you still insist in knowing why, there you go: the flavor of fire (of which I am a fan) was more present at l’Arpege (but that has to do with my choices of food, not the fault of the kitchen at Pg) and the best items at L’ Arpege fared slightly more delicious to my palate ….slightly i’ll stress because Pg’s work of the flavors is generally outstanding (the superlative vanilla souffle/beets/lamb, etc).